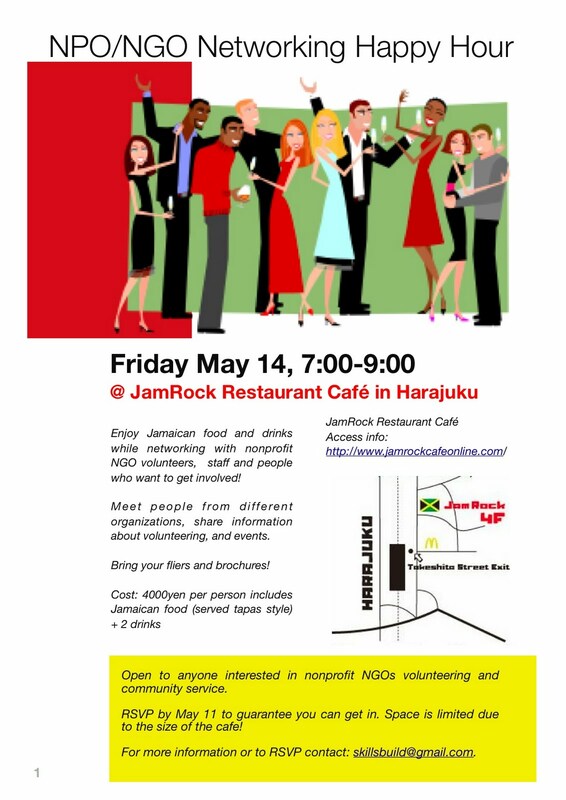 Monthly events and meetings of nonprofit NGO staff and leaders in Japan. we can chat afterward over coffee or a beer. You can help Palestinian kids get a good meal! 300,000yen can provide 1000 meals! You can help women and children in rural Cambodia get basic health care! SKYLINES 2009 is looking for orgs to support! 5,000 Yen for reservations/payments before Feb 19. Funds raised will go to 2 nonprofit organizations working in the areas of child and maternal health. The organizations will be announced on Dec 15. We are currently soliciting Request for Support applications from a wide array of groups working in the field of child and maternal health. We would like to select 2 Japan-based organizations, one active locally and one active internationally. We are in need to items to be used as auction and raffle prizes. Items we need include: certificates for dinners, hotel stays and trips, tickets for plays, concerts or other special events, DVDs, gift baskets/sets, wine, liquor, memberships or subscriptions, electronics etc. Cash donations will be divided equally among the nonprofit organizations we support. Donations in goods or services will be used at the party to raise funds for the nonprofit organizations. 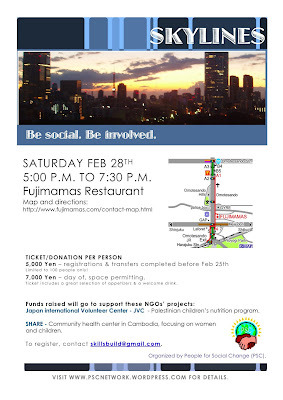 Coordinated by Sarajean and the PSC – People for Social Change – a Tokyo-based volunteer group committed to community involvement.To get a Request for Support application, donate prizes for the raffle, help out with the party or find out more, please contact skillsbuild@gmail.com. Contact skillsbuild@gmail.com before April 23 if you want more info. * RSVP by WD Feb 20 skillsbuild@gmail.com.